"Green Earth" has always been committed to the development of environmental protection in the earth, Each order will have one dollar donated to environmental organizations in the world for governance of global warming. Adjustable Switch, It can be adjusted to provide appropriate water according to different plant needs, can control the velocity of flow, so you don't have to worry about the water being too fast or the hole being blocked. 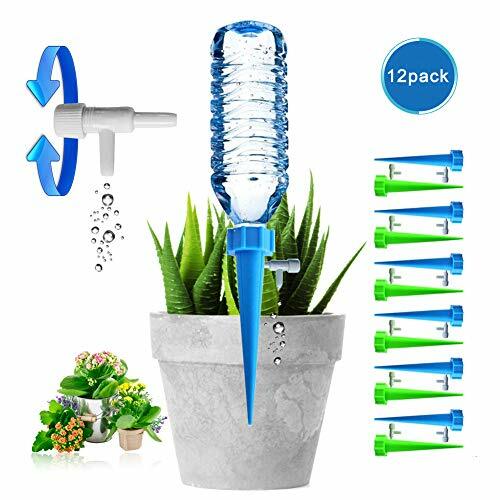 The new upgrade gives Plant Watering stakes a better air tightness, which makes the water in the bottle not flooded you flower box and killed everything. Your satisfaction is our top priority. This product supports 60 days unconditional refund, 365 days replacement service. You can contact us if you have any problems with the product, we will provide you with a solution within 24 hours. 100% assured purchase. 【Flow Controllable】: You can set traffic for 1-15 days or more depending on the time you need, ,No troublesome setup. Upgraded equipment is more sealed, auto water plants will not be blocked by mud and stop draining or will not flooded you flower box and killed everything. 【Easy to use】: Dr.pepper,Pepsi,coca cola,Lipton,Deet Coke,Aqufina or other bottle that have 1.1inch inner diameter capsule, Without any tedious installation, all you need just drill some holes at bottom of bottle or cut it and then a regulating valve that can adjust the speed of the flow, so that the speed of the flow can be adjusted according to the length of the holiday. 【Multi-Scene Application】: Whether your plants are indoor or outdoor or garden, at home or in the office, Create a self-watering system, to ensure your plants always have enough moisture. Fits for use with potted plants, houseplants, patio plants, hanging baskets, desk pots, hanging plants and outdoor gardens. 【Economic And High Quality】: This plant watering system is made of ABS plastic. A green and environmental product approved by the environmental protection department. High quality means that each water spike has a working life of more than a year, and our water spikes are more durable than other water spikes. 【Service Commitment】: Enjoy your vacation with your family,your plants leave to me. This product supports 60 days unconditional refund, 365 days replacement service. You can contact us if you have any problems with the product, we will provide you with a solution within 24 hours. 100% assured purchase. If you have any questions about this product by Green Earth, contact us by completing and submitting the form below. If you are looking for a specif part number, please include it with your message.